In 1992, on the occasion of Montréal’s 350th birthday, the City of Berlin gave the city a rough sliver of concrete about three metres tall and a metre wide salvaged from the Wall’s great fall in 1990. Vivid graffiti covers what was the western side of the slab. An orange sunburst. Swirls of green and blue. The letters “EAS,” no doubt part of a longer word truncated when the Wall came down. There is no such decoration on the severe eastern side. Just a few numbers and initials. The lost acronyms of the Iron Curtain. The slab used to form part of the “anti-fascist protection bulwark” near Berlin’s Brandenburg Gate. Now it stands in a shopping mall on the first floor of Montréal’s World Trade Centre, a name that sounded less ominous back in 1992. I considered a downtown shopping mall an undignified resting place for a fragment of the Berlin Wall. A mall is a place to find an Orange Julius, not an exalted remnant of the Cold War. Regardless of where it stands, the Montréal shard – just like every other souvenir fragment of that infamous barrier – reminds us that walling is a human impulse. The ancient emperors of Rome and China taught us this first, and passed along a hereditary urge to harden our edges with bricks and mortar, barbs and steel. During the research for Walls Travels Along the Barricades, I’d travelled to see what happens after the Walls rise, and to learn what it means to live alongside a wall. I discovered that the walls breed societies of resistance in their shadows. Resilient men and women who physically defeated their walls, artists who drew down the walls by reimagining them, and activists who worked to dress the wounds the walls inflicted. Although I never found a wall about to fall, I did find a kind of optimism in the actions of the resisters — a faint glance to an imagined time when the walls stand disassembled in distant shopping malls. This is what I had wanted to find. But I found more despair than hope. I found families shattered along the walls and bodies scarred. I learned of withered dead lying in deserts, and saw hate boil hot and steady. Torn flesh and thrown stones did not stall the new Hadrians. Nor did the tears of mothers and migrants and refugees dissuade them. The walls rise and grow and multiply. They are both human and inhumane. The walls are our compulsion. The walls are our chronic disease. The cracked relic of the Berlin Wall stands in downtown Montréal because it reveals something else: the urge to tear down barriers is a stronger impulse than the urge to build them. We cannot help but subvert the walls. What eventually wins out is not the crude desire to wall, but the impulse to break through. 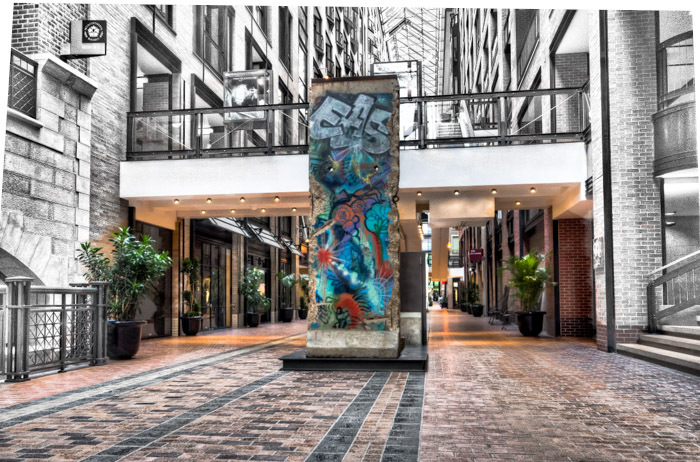 The piece of the Berlin Wall in Montréal was a gift to the city, a trophy, because it symbolized a fallen wall and a barrier that surrendered to a human compulsion greater than that which built it. The fragment reminds us of the inevitability of our better natures, and in this the constant thrum of hope. The walls will continue to rise, and we will continue to tear them down.